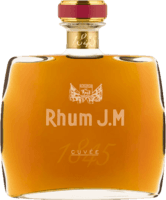 Have you found an online vendor selling Rhum JM Gold? 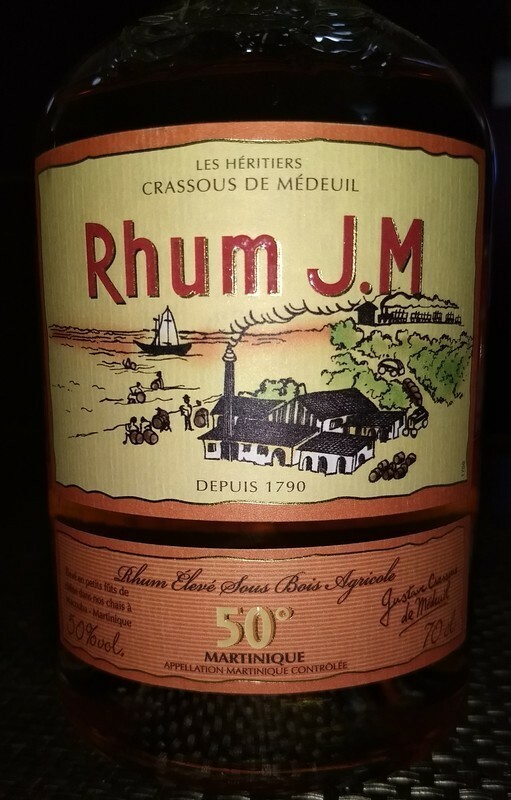 It took me quite a while to obtain a bottle of Rhum JM rum. Hard to come by in this part of Florida. However it proved to be well worth the effort. This rum is helping cement my affection for good agricole rums from Martinique. Don't know why exactly but I know I like Martinique agricole rums thus far. The color is a beautiful pale amber. The aroma in my snifter is distinctly cane juice but almost like a brandy. Kind of surprising. The flavor is nice and grassy with distinct sugar cane juice flavor. Can't miss that. Some spiciness to it. At 100 proof (50% ABV) it has a little more of a kick to it than regular rums but it does not make itself known with a heavy burn but instead a strong warmth that lasts longer than most. The finish has some oak to it as well as the spiciness I mentioned earlier. Definitely drier rum. Very good. Delightful, even. Could be used as a sipping rum if one is so inclined but I recommend it be used as a mixer especially in classic tropical drinks. Zombie, anyone? Round, sweet, grassy, tequila-like nose. A friend said "nutty," which I agree with as well. Hugely grassy taste. The strength (100 proof) shows through in astringency. Medium-short finish. Very nice! In typical JM fashion, this is an archetypal rhum agricole (elevé sous bois). Probably makes a killer Ti Punch. Mellows out nicely a bit after breathing. First they are not easy to get, once we got the bottle down it took about 4 months to replace it with our local international spirit merchant. 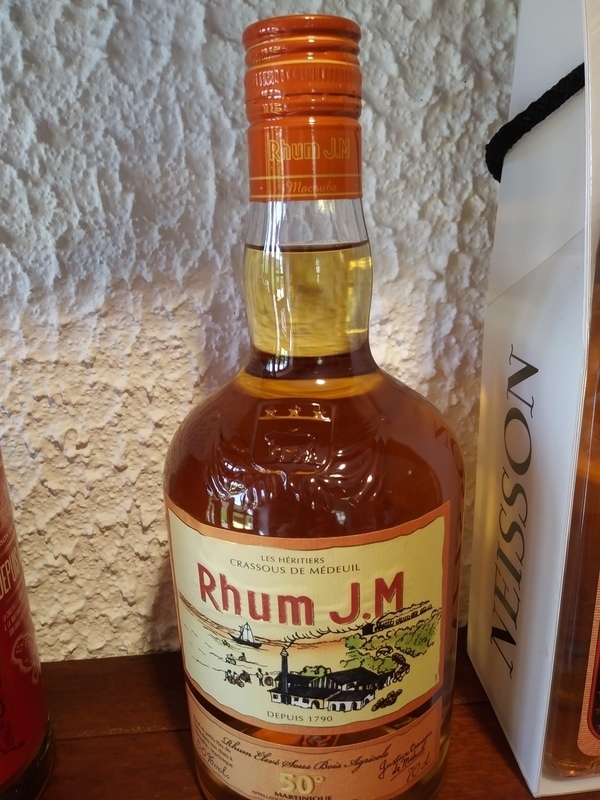 J.M are quite Rare, but i think that rum is always good to pair with a bit of sugar and lime or some exotic jam or chutney, This is how it seems to be drunk in Martinique. If you drink it on its own, you will most likely loose the purpose of this rum, which is to be worked on with some basic ingredients according to taste. Since I was quite impressed with their 3 year old VO and less impressed with their older VSOP, I dropped down to this 12 month aged agricole from them. I can also thank Rhum Clement for showing me that less aging and cheaper prices make for a better rhum agricole all around. It now looks like 3 years is optimum for aging agricoles. Well, this gold rum is at 100 proof. The aroma is vegetal and mild wood. The taste is very hot pepper on the tongue with some burn going down if sipped neat. Adding an ice cube tames it, but at $40 US, all I can say for it is that it's bourbon qualities are minimized due to only one year of aging. It has moved up from my initial rating of 6 and also goes great with ginger ale. I will take the J M rhums any day over Clement rhums! Visited the Rhum JM distillery while vacationing in Martinique. Self guided distillery tour ended with an open tasting bar. Rhum JM Gold was priced at EUR 19 per bottle at the distillery. Pale golden color. Very nice and sturdy bottle design with a great old school label. Traditional super dry Rhum Agricole flavors complemented with plenty of grass, strong oak and a lot of floral notes to the nose and palate. Surprisingly strong burn at the end since its so dry. Rhum Agricole fan boys can easily add 2 points to my score. I’ve tried this rhum for the first in Martinique at the Distillery. At the end of the tour, we tasted several different products of different ageing. This one was excellent served in the Ti Punch. Its taste is pure sugar cane with some scent and note of tropical fruit with a bit of personality given by the ageing. It’s not the rhum you want to drink plain because it’s not very smooth and not enough complex in terms of flavours, but with a slice of lime and a teaspoon of cane sugar it’s just amazing. Because this rum is a grass to glass alcohol, it has an extreme grassy taste to it. The liquor is smooth, but the green taste is why I had to take 4 points away. Another agricole added to the bar after enjoying the JM VSOP. Unlike the later, this bottle was only aged for 12 months in oak barrels making it neither a white rhum nor an aged rhum and at 50% packs a much stronger punch. On the nose- cane juice, pepper and grass. First sip- The grass and alcohol smack you in the mouth instantly. Very spicy with notes of cane juice, nuts, pepper and oak. Very intense warmth instantly that mellows just as fast with a long tingly finish. Smoother than I assumed this 100 proof would be but not the biggest fan in the world regardless. Much Earthier than the VSOP. I think this would be great for cocktails, on the rocks or with a splash of water. I'd probably give this a 6 out of 10. Not my favorite dram but not bad at all. If you see a bottle give it a go as it's not very expensive. Enjoy! This is the first agricole I have tried. It's young aged for 12 months in charred ex bourbon barrels and hailing from the French overseas territory of Martinique. It's fresh and floral on the nose, it's nice but different to the Spanish / British rums I am accustomed to. It's bottled at 50% which in my opinion makes it a little too firy to sip neat. The grassiness of the nose comes through on the palate, I could drink it over ice but prefer it mixed. Would make a good cocktail rum and a good price at just over £30 on Amazon. Would definitely buy again and would like to try others from the JM range and other agricole rhums! Prima argricole om als mixer te gebruiken. Jaartje gerijpt op ex-bourbon vaten. Grassig, specerijen en hout. 50% abv. Goede voor in een Ti'Punch. This was a gift, glad I didn't spend the $50 for it or I would have been disappointed. 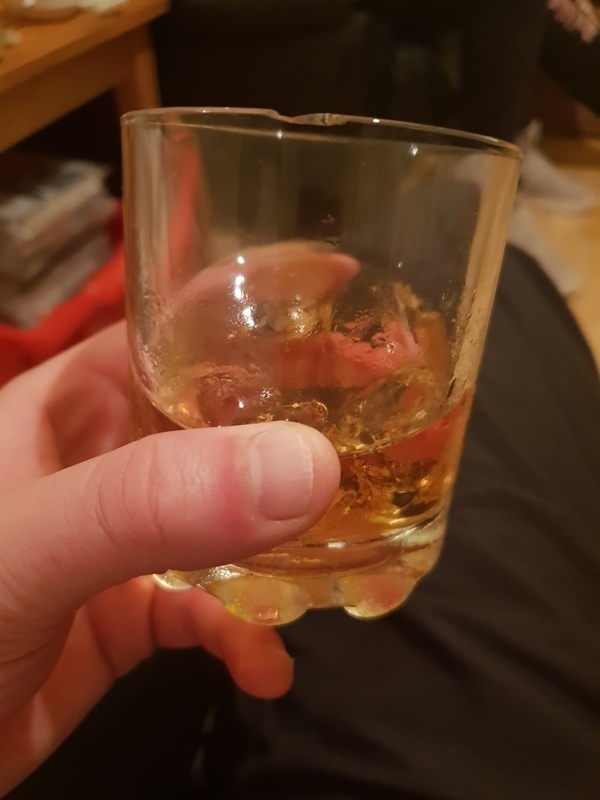 I feel like I am sipping a strong whiskey or green label bourbon, Don't get me wrong, it is tasty but it seems more like a corn mash then a cane mash. Has a sharp bite like Jim Beam and if it was much sweeter it would be a Southern Comfort look-a-like. I'll finish the bottle and enjoy it but it was not the rum I was looking for. I am only starting to really taste and learn about agricol rhum, so I don't have much to compare it with. But overall it seemed a bit like drinking brandy, with a more almost herbal smell and taste, from the sugar cane I think. 50% is also a little harsh. Ein Agricole ohne Zusatz von Zucker, Karamell o.ä. (sagt der Hersteller). Kann angehen, denn er ist trocken, schmeckt irgendwie "ehrlich" und trotz der 50% nicht alkoholisch. Etwas Bitterschokolade. Nicht schlecht für den Preis. Bottled at 50% and for a good reason. It's a young rhum with only 12 months in oak, the extra kick cuts the sugar. What it equates to is a huge blossom of pepper, banana and papaya seeds wrapped in an essence of oak. It's a perfect bottle to geek out on because it's neither a white nor 'aged' rum though defiantly more in the blanc camp. It's Huge in every sense and can either be sipped or mixed. It's rich without being cloying. Best of all it's priced right. Great buy. Of course, it is not to drink a lot. The smell is strong, not tamed by a barrel - sugarcane, yeast, black pepper. Reminds the carmener. Burns the tip of the tongue, the tree bark and sweetness are felt. After a few moments, it lights up the palate and the gums. Fire without rage, woody, creamy. Bitterness and lump in the throat. This rum has a calming, relaxing and weighting effect. Rough as a sipper, akin to rocket fuel and some moonshine I've had! Reasonable as a mixer, flambes beautifully and adds wonderful taste when added as the final ingredient to bananas foster. Firey on the palate when sipped, perhaps better when mixed, providing subtle rum notes while maintaining a good kick. Avec une aqulité dans la lignée des autres JM, il est évidemment plus orienté cocktails.